The country is celebrating Ganesh Chaturthi today, marking the birth of Lord Ganesha. For this festival, people bring home handcrafted idols of Ganesha for 3-10 days and later immerse them in a water body. Ganpati is also called Siddhivinayak because he removes obstacles and the Lord of beginnings, so bringing him home is auspicious. Just like the other devotees in the country, Bollywood celebs have also gotten into the festive mood and welcomed Lord Ganesha into their homes and offices. For years, we have seen Bollywood stars celebrating the festival with masti and a whole lot of music. 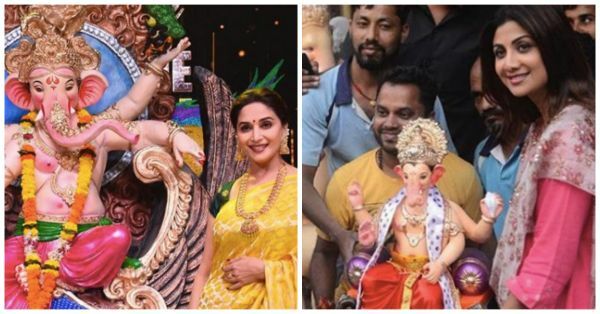 So, play on some Bollywood-approved Ganpati songs and take a look at how they welcomed Lord Ganesha into their life today.